A couple of months ago, my daughter sent me a link to a place in San Francisco that I just didn’t have a name to describe. Some might call it a museum. Or maybe it was a pop-up experience? To me it looked like attending a toddler birthday party while on ’shrooms. It’s essentially a space designed for the selfie generation. In one room you wander through millions of ribbons hanging from the ceiling. In another, rainbow confetti showers over you. And there’s no need to keep your smartphone at the ready for that perfect shot. In each room, cameras click away at just the right angle and with perfect lighting. It’s nearly impossible to take a bad picture … and that’s kind of the point. This place was designed for sharing. 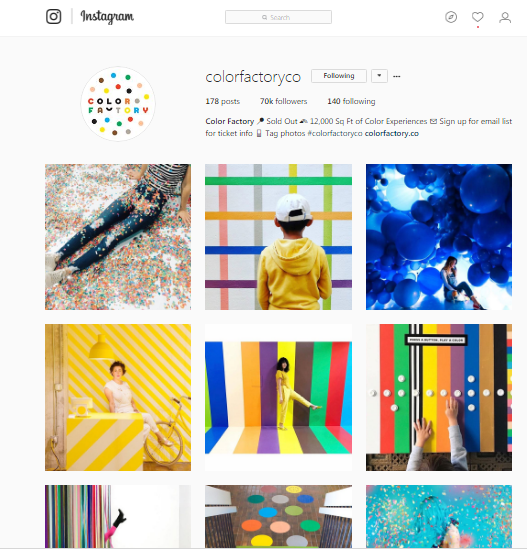 I’m betting not a single person visits the Color Factory without posting (stunning) images on social – most often Instagram. 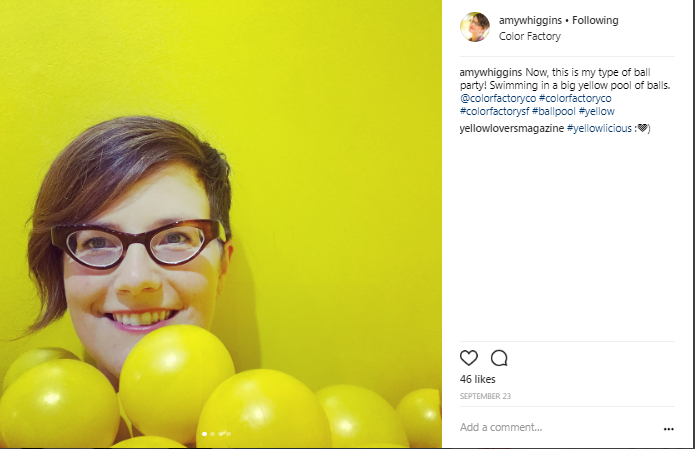 After my daughter alerted me to it, I spotted fantastic pictures of @amywhiggins in a Day-Glo yellow ball pit. I didn’t need to see an ad or sponsored social content to know that on my next trip to San Francisco, I’m booking a ticket. Plenty of brands have noted this concept even before the Color Factory opened its doors and tried to design what I’ll call “selfie moments.” I’ll venture to say most are weirdly gratuitous selfie moments … and that’s OK because it’s in keeping with the brand. The Cheetos Museum wasn’t intended to be a transcendent experience. Cheetos invited people to submit pictures of their most interestingly shaped puffed cheese snacks. (Kind of like a modern version of finding the likeness of the Virgin Mary in an everyday object.) Winners were displayed in a museum-worthy temporary space in New York’s Times Square, but an online museum also memorialized the curled cheese crunchies. These are fleeting experiences for brands to create a short-lived memory or brand association. They are passing campaigns from brands thinking more about advertising and less about longer-term relationships. 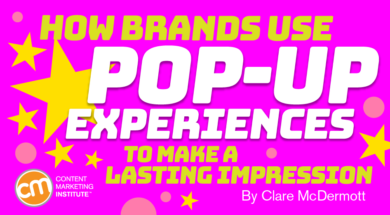 What is it about pop-up experiences that deliver something a little more meaningful? 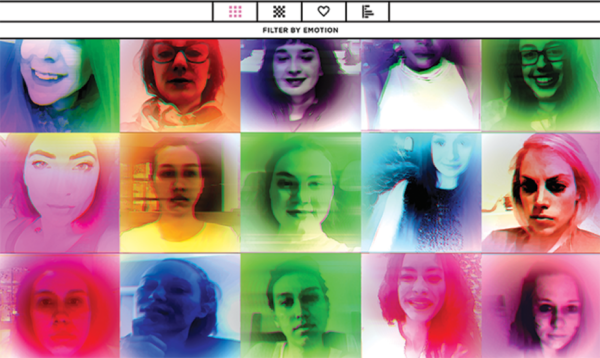 Maybe an experience that transcends the selfie moment and has more staying power? 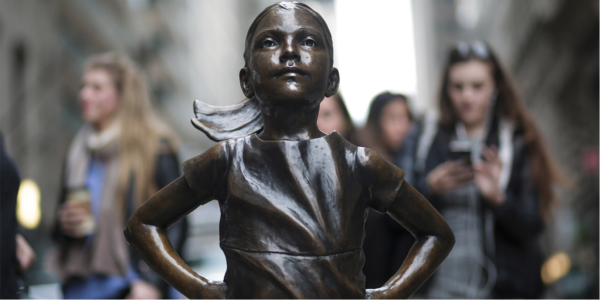 In recent months, I’ve spotted some amazing examples of brands that aim to capitalize on the selfie moment, but do so in a way that’s true to the brand and not quite as cheesy or fleeting as the Cheetos Museum. 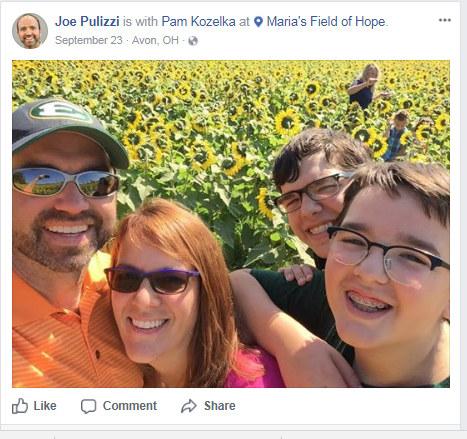 I found out about Maria’s Field of Hope on social media, where all my Cleveland-based friends were suddenly posting images of their families posing in endless fields of sunflowers. Like any mildly curious individual, I searched on Google for Maria’s Field of Hope and found out it was launched by the Prayers from Maria Foundation, a nonprofit devoted to funding global research into gliomas, a form of childhood brain tumors. The first field of sunflowers was planted in 2014 to draw attention to the lack of funding for childhood cancer, but the arresting images of sunflowers spread via social have pushed the foundation’s message much farther than typical social media messaging could have achieved. GE won a lot of attention a few years ago for its pop-up garages, essentially maker spaces for those curious about new manufacturing technologies such as laser cutting, 3D printing, and CNC mills. But GE has a long history of bringing its ideas and passions to life in the real world. GE hosted a campus bus tour – part of its Balance the Equation movement, which aims to attract more women to work in the STEM fields. The bus tour stopped at a half-dozen campuses and helped students set up professional social media profiles on sites like LinkedIn. Chief Marketing Officer Linda Boff told CCO magazine, “You may expect LinkedIn to show up on campus and teach kids how to update their social profiles … but we work really hard to bring the brand to life in ways that people can feel and touch.” In other words, it’s less about creating a moment, and much more about creating a deeper relationship. One of my favorite examples is the Crop Adventure from Land O’ Lakes (the butter people). The museum experience is built into an existing destination: Fair Oaks Farm, the largest agri-tourism destination in the United States. Land O’ Lakes partnered with Fair Oaks Farms in Indiana to build a 12,000-square-foot Crop Adventure exhibit that highlights how high-tech tools like drones will play a part in modern farming. Land O’ Lakes CEO Chris Vilsack explained to local media, “I hope that when young people go through it the first reaction is, ‘I didn’t know that, I want to know more … I want to be the scientist, I want to be the farmer. I want to be in the new economy that is displayed here.’” The Crop Adventure destination is part of a bigger push by Land O’ Lakes to be a leader in the conversation about modern farming; its hallmark event, Fields of the Future, aims to raise awareness about the complex challenge of feeding 9 billion people by 2050. Why does the Creative Farm make my list? It’s not exactly a selfie-machine. I love this idea because it capitalizes on the network effect of the social graph, but it’s focused inward on a single brand’s culture and knowledge sharing. The Farm Studio (as well as adidas’ other hubs in Germany and Portland, Oregon) is intended to be a creative collaboration space, but even more, it’s designed to create a ripple effect of knowledge sharing and culture transfer across the organization … much like the Color Factory images spread virally across Instagram. In this case, however, the shareable experience is less about imagery (though there are some amazing images coming out of the Farm Studio) and more about ideas. How will you create interactive, memorable, and shareable experiences beyond those you serve up on a screen? This is the question every brand – not just consumer-facing brands – should be grappling with. Want to experience a content marketing selfie opportunity? Attend an upcoming CMI Master Class this year. Check out the dates and cities for the rest of 2017.